The cell. 5. Vesicular trafficking. Golgi apparatus. Atlas of plant and animal histology. Golgi apparatus was discovered by Camillo Golgi in 1889, when he was studying neurons, but it was no completely accepted as a true organelle for decades. Membrane organization of the Golgi apparatus was described in detail by Dalto and Felix (1954) by using transmission electron microscopy. They proposed the name Golgi apparatus. In animal cells, the Golgi apparatus is commonly located close to the centrosome, which in turn use to be near the nucleus. This position is determined by the interactions of Golgi membranes with microtubules. Microtubules are radially oriented with their minus ends anchored to the centrosome. Golgi apparatus is made up of flat cisterns piled in several stacks. Each stack is referred as dictyosome (Figures 1 and 2). cisterns are usually thinner in the middle and thicker in the edges (like pizzas), and are more or less bent showing a convex and a concave surface. Several stacks are present in one cell and some cisterns are large enough to be part of two near stacks (Figure 1). The number (normally 3 to 8) and the size of the cisterns in one stack are variable and depend on the cell type, as well as the cellular physiological state. In one cell, the Golgi apparatus includes all the stacks and their lateral connections. Figure 1. In animal cells, Golgi apparatus is made up of several stacks, located close to the centrosome, and therefore close to the nucleus. Some nearby stacks are laterally connected. Figure 2. 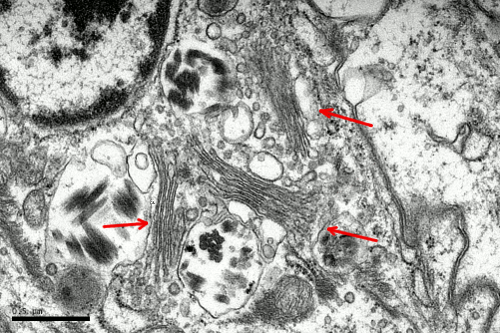 Transmission electron microscopy image of Golgi apparatus showing several stacks (arrows). In animal cells, there is a fibrous protein matrix where Golgi cisterns are located that may help to maintain the Golgi apparatus structure. However, it has been shown that the structural integrity of the Golgi apparatus mainly relies on microtubule organization (Figure 3). 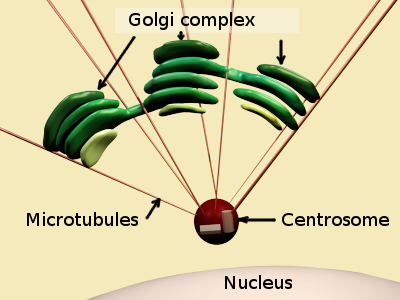 The position of the Golgi apparatus depends on microtubules nucleated from the centrosome, whereas the stack integrity is maintained by microtubules nucleated from the Golgi cisterns. Actin filaments and myosin motor proteins help to fine-tune the final location of Golgi stacks. In addition, the Golgi apparatus structure depends on the vesicular trafficking between the Golgi apparatus and the endoplasmic reticulum. When this trafficking is stopped the Golgi apparatus disappears. Figure 3. Organization of the Golgi apparatus in animal and plant cells. 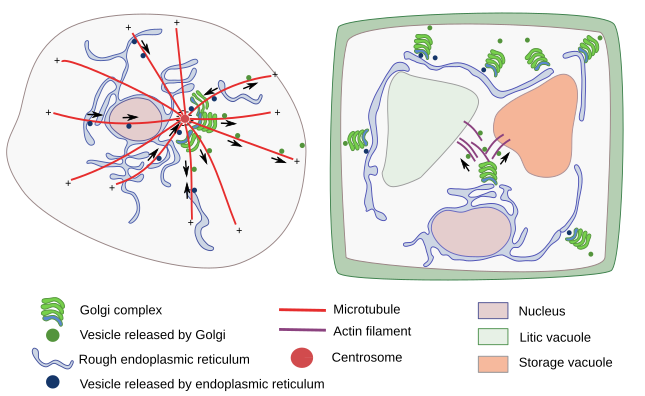 In animal cells, Golgi stacks are located close to the centrosome, near the nucleus, and are dragged mainly along microtubules. In plant cells, cisterns are distributed through the cytoplasm, they are moved by actin filaments. Arrows indicate the movement direction of the vesicles. In plant cells, which do not have centrosomes, there are small stacks of cisterns or even individual cisterns dispersed throughout the cytoplasm (Figure 3). The Golgi apparatus looks like divided in many units distributed through the cytoplasm. Each of those units work independently. Plant Golgi apparatus cisterns are smaller than in animal cells, although the total number in a cell could range from dozens to more than a hundred. In plant cells, ERGIC (see below) has not been observed, but the trans Golgi network (TGN) is well developed, so much that some authors endorse it as a different organelle. Individual cisterns or stacks are moved thanks to actin filaments and are found around the transitonal areas, where there is vesicle formation by the endoplasmic reticulum. The stack organization does not change during these movements. Vesicles released from the stacks that are targeted to vacuoles are moved by actin filaments too. One more feature of Golgi apparatus organization in plant cells is that cisterns do not disappear during mitosis, as it occurs in animal cells, because Golgi apparatus is needed for synthesizing the new cell wall that separate the two new cells during cytokinesis. There are differences in the Golgi apparatus organization depending on the cell type and in different species. For instance, the fruit fly cells show a Golgi apparatus organization similar to that of plant cells, although they have centrosome. Furthermore, the lateral connections between adjacent cistern stacks have only been observed in mammalian cells. Golgi apparatus is a polarized organelle. Cistern piles are organized in domains: cis, intermediate and trans domains (Figure 4). Intermediate cisterns locates between cis and trans domains. In the cis domain, there is an ongoing addition of new material coming from the endoplasmic reticulum via the ERGIC (endoplasmic reticulum Golgi intermediate compartment) compartment. In the trans domain, there is a tubulo-vesicular arrangement of the membranes, referred to as TGN (trans Golgi network), where molecules are distributed into vesicles and tubules in their way toward other cell compartments. Thus, molecule journey through the Golgi apparatus starts in the cis cisterns, goes through intermediate cisterns, and ends in the trans domain. The Golgi apparatus is in permanent renewing and its organization and size is affected by the trafficking of molecules. It is particularly well-developed in those cells showing an intense secretory activity. The resident Golgi enzymes involved in modifying the molecules that go through the organelle are selectively distributed in a specific domain (cis, intermediate or trans) according to the chemical reaction they are performing. Figure 4. Golgi apparatus is divided in domains. Cis domain is where ERGIC bodies and vesicles coming from the endoplasmic reticulum fused between each other to form the first Golgi cistern. ERGIC is not a Golgi compartment, but a transient one between the endoplasmic reticulum and Golgi apparatus. cisterns in the middle of stacks are known as intermediate cisterns. Trans domain is where cisterns are transformed in vesicles and tubules containing the molecules to be delivered. TGN (trans Golgi network) is this trans network of vesicles and tubules. Red arrows indicate the main flux of molecules to be processed in the Golgi apparatus. From the lateral part of cisterns (gray arrows), COPI coated vesicles arise and are moved toward the endoplasmic reticulum. This is a recycling pathway. a) Cisternal maturation model (Figure 5). It proposes that ERGIC bodies get fused between each other to form the first cistern at the Golgi cis domain. Then, this cistern moves toward the trans domain, where it is eventually split in vesicles. The internal material of the cistern is progressively processed during this journey, i.e., there is a maturation of the cistern. Currently, this is the most accepted model because it can explain some observations that do not fit in other models. Figure 5. Models for molecular transport (colored in orange) and processing through a Golgi stack. In the cistern maturation model (upper), cisterns are generated in the cis domain and subsequently moved toward the trans domain, while molecules are being processed. In the trans domain, cisterns get split in many vesicles. In the vesicular transport model (lower), molecules are transported from one cistern to the next by vesicles (orange colored vesicles). b) Vesicular transport or stationary cisternae model. In this model, ERGIC and vesicles coming from the endoplasmic reticulum are fused with the cis cistern. From cis cistern, vesicles bud and fuse with the next cistern of the Golgi stack. In this way, the molecules are transported by vesicles from one cistern to the next, while they are specifically processed in each cistern. The cistern of the trans domain does not disappear when molecules are packaged into vesicles. The support for this model has declined nowadays. c) Connection by tubules. Tubular connections between adjoining cisterns have been observed at electron microscopy. These connections are like bridges that appear to be transient and depending on the material to be processed. This proposal is not incompatible with the other models, since tubular connection may happen in both between stable cisterns and between cisterns that move through the stack. a) The Golgi apparatus is the main glycosylation center of the cell. Many carbohydrates that form part of glycoproteins, proteoglycans, glycolipids and other polysaccharides, such as hemicellulose in plants, are added and modified in the Golgi apparatus. Sialic acid is a carbohydrate specifically added in this organelle. Carbohydrates are added through a particular type of binding known as O-type glycosylation, which is the attachment of carbohydrates to the hydroxyl groups of the amino acids, such as serine, threonine and hydroxylysine. Sulfation of proteoglycans also happens in the Golgi apparatus, as well as phosphorylation, palmitoylation, methylation, and other chemical modifications. In plants, the glycosylation function of the Golgi apparatus is essential because many glycoconjugates are part of the cell wall. However, cellulose is synthesized at the cell membrane. Carbohydrates are added by glycosyltransferases and removed by glycosidases. About 200 different types of these enzymes can be found in the Golgi apparatus. Different cisterns have different roles in the carbohydrate processing, which is an ordered process. Evidences suggest that there is a concentration gradient of enzymes, from cis- to trans-domain, so that those enzymes involved in the first steps of glycosylation are concentrated on the cis domain, and those participating in the last steps are mostly found near the trans domain. b) The synthesis of sphingomyelins and glycosphingolipids is accomplished in the Golgi apparatus. Ceramide, synthesized in the endoplasmic reticulum, is the molecular base used by enzymes located in the Golgi apparatus for synthesizing these lipids. VLDL (very low density lipoproteins) are apolipoproteins that are also assembled in the Golgi apparatus. c) Golgi apparatus is a center for shipping molecules coming from the endoplasmic reticulum or synthesized in the Golgi apparatus. Once processed, molecules are distributed into different types of vesicles which are targeted to other cell compartments. In the trans domain, TGN is the structure where this process takes place (see figure). 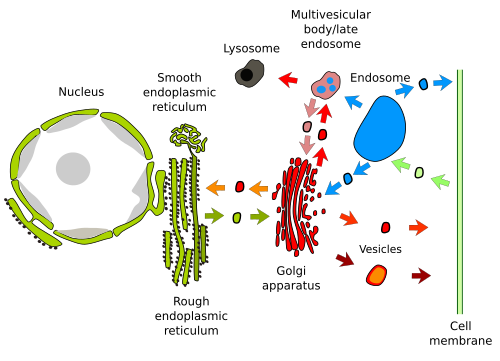 Some vesicles are moved to and fused with the plasma membrane, process known as exocytosis. There are two types of exocytosis: constitutive and regulated (see next page). Furthermore, there are vesicles leaving the trans domain targeted to late endosomes/multivesicular bodies/lysosomes, or to vacuoles in plants. Trans domain is also a target for other vesicles coming from endosomes, where some molecules are recycled. In plants, Golgi apparatus can receive vesicles directly from the plasma membrane. Thus, Golgi apparatus participates in both, endocytosis and exocytosis. A variety of vesicle morphologies arise from tubular expansions of the TGN membrane complex, not just typical round-shape vesicles. Molecules must be selected and included in specific vesicles to be shipped to different targets. Those transmembrane proteins targeted to late endosomes (and basolateral membranes in epithelial cells) are selected by a particular amino acid sequence of the cytosolic domain. However, molecules targeted to plasma membrane (or to the apical membrane of the epithelial cells) are selected by selectins which recognize O and N glycosidic bonds. Cytoskeleton moves vesicles to their target compartment. For example, in animal cells, microtubules transfer vesicles to the plasma membrane, whereas in plant cells, vesicles targeted to vacuoles are propelled along actin filaments. d) Golgi apparatus performs other non-conventional functions. It works as a calcium store, as an intracellular signaling platform, contributes to the cellular levels of sterols, starts the cell response to starvation, and is a microtubule nucleator.